The popularity of the Internet and the affordability of IT hardware and software have resulted in an explosion of applications, architectures, and platforms. Workloads have changed. Many applications, including mission-critical ones, are deployed on various platforms, and the IBM® System z® design has adapted to this change. It takes into account a wide range of factors, including compatibility and investment protection, to match the IT requirements of an enterprise. 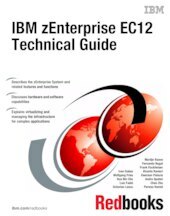 This IBM Redbooks® publication addresses the new IBM zEnterprise® System. This system consists of the IBM zEnterprise EC12 (zEC12), an updated IBM zEnterprise Unified Resource Manager, and the IBM zEnterprise BladeCenter® Extension (zBX) Model 003. The zEC12 is designed with improved scalability, performance, security, resiliency, availability, and virtualization. The superscalar design allows the zEC12 to deliver a record level of capacity over the prior System z servers. It is powered by 120 of the world's most powerful microprocessors. These microprocessors run at 5.5 GHz and are capable of running more than 75,000 millions of instructions per second (MIPS). The zEC12 Model HA1 is estimated to provide up to 50% more total system capacity than the IBM zEnterprise 196 (z196) Model M80. The zBX Model 003 infrastructure works with the zEC12 to enhance System z virtualization and management. It does so through an integrated hardware platform that spans mainframe, IBM POWER7®, and IBM System x® technologies. Through the Unified Resource Manager, the zEnterprise System is managed as a single pool of resources, integrating system and workload management across the environment. This book provides information about the zEnterprise System and its functions, features, and associated software support. Greater detail is offered in areas relevant to technical planning. It is intended for systems engineers, consultants, planners, and anyone who wants to understand the zEnterprise System functions and plan for their usage. It is not intended as an introduction to mainframes. Readers are expected to be generally familiar with existing IBM System z® technology and terminology.